Amazing kham study culture trek is the special trek designed for the tourists who are interested to explore Kham culture including their unique practice of shamanism. Kham culture is very popular in Gurung people who live in Myagdi and Rukum districts of Nepal. Their main profession is to grow different types of food grains and keeping sheep’s in a large volume in other words they are shepherded by profession. They bring large volume of sheep’s in mountain area and change their habitants depending upon the season and weather. In summer they bring sheep’s higher mountain to protect them from warm and in winter bring down hill to protect from cold. Shepherd they keep some dogs to protect sheep’s from wild animals like Leopard, wolf and bears. The dogs are really very strong and can kill the Leopard if they come to attack sheep’s. Flora and fauna are another attraction of this trek. A very expensive plant found there is “Cordyceps”.People use it for the medicine and it will increase the stamina of sexual power or we can say it is the natural Viagra. The Nepali name of this plant is “Yarshagumba”. Shamanism is very important in Gurung people to heal the sick people and the shaman drives away all kinds of bad evils from their society and area of the territory. 03 Day: About 6 hours trek to Takasera (2400 m).Here you will explore Kham culture, shaman dance and beautiful village. 04 Day: About 6 hours trek to Maya (2500m).Here you can see beautiful waterfalls. 05 Day: About 5 hours trek to Maikot (2600m).this place is popular for Kham culture, shaman dance, Masto pilgrim. 06 Day: About 6 hour trek to Pelma (2650 m).Shaman dance, beautiful waterfalls and herds of sheep are the most attraction. 07 Day: About 6 hours trek to Thangkur (3000 m).Here you can see beautiful view of Dhaulagiri and Lakes. 08 Day: About 6 hours trek to Gurjaghat (3020m).Here tourists can see beautiful valley, Herd of blue sheep and waterfalls. 09 Day: About 6 hours trek to Moreni (2450m).Jaljala pass (3400m) and dense forest are the main attraction. 10 Day: About 6 hours trek to Takam (1650m). 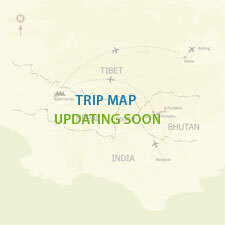 12 Day: About 8 hours drive to Kathmandu. 13 Day: Drive to international airport and fly back.